Being a general is never easy. Being a general in Immoren of the Iron Kingdoms is even harder. Not only do you have to worry about battle strategy and resource management, but you also never know which crazy enemy will come streaming over the horizon. And let’s face it. All of the armies in this land are forces to be reckoned with. 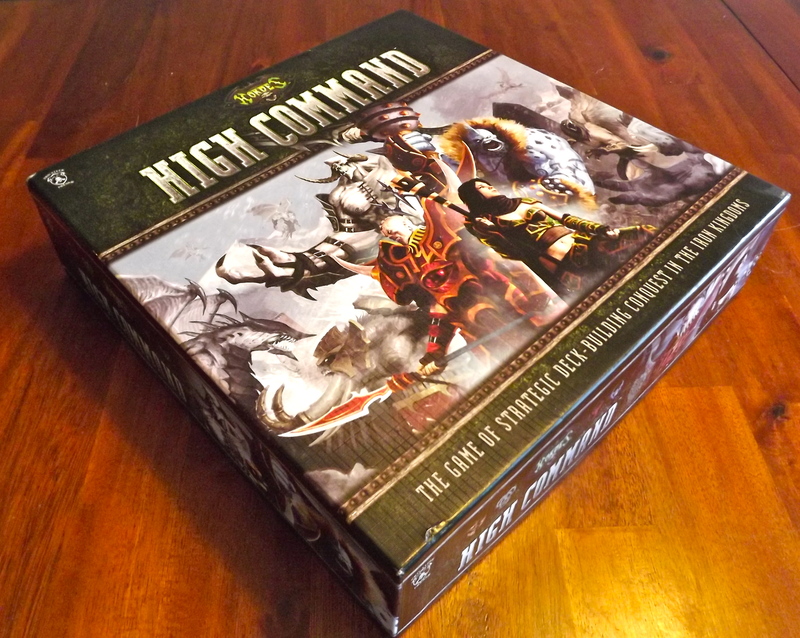 In Hordes: High Command you take control of one of four factions. You can choose Trollbloods, whose love of ale is only overshadowed by their love of battle; The Circle of Orboros, mysterious druidic forces that roam the wilds making unholy alliances with beasts; The Legion of Everblight, whose devotion to an undying dragon god gives them access to vast power – but for a price; or Skorne, the masters of suffering, who have seen what lies beyond the grave and want no part of it. Commanding one of these armies you will crush your enemies and see them driven before you. In Hordes: High Command the goal is to score the most victory points before the end of the game. Players may do this by capturing location cards and purchasing army cards. The game is split into two steps – the Winds of War step and the Player turn. 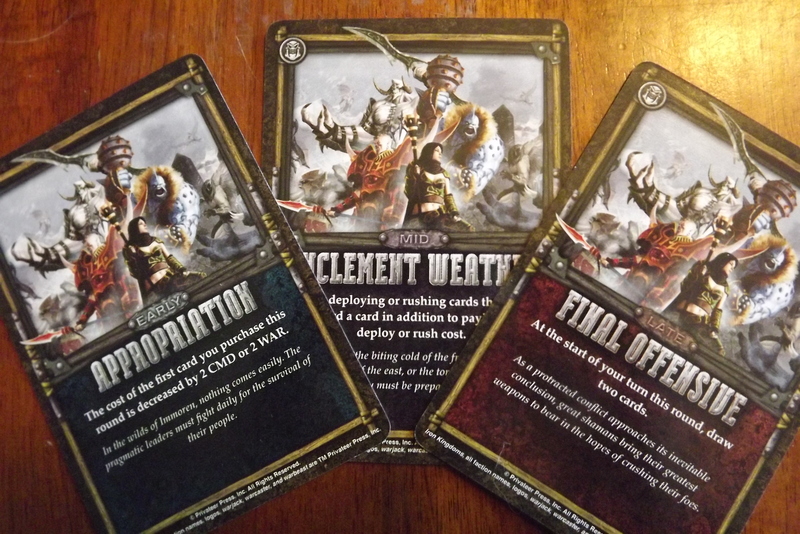 The Winds of War is completed just by drawing the top of the Winds of War deck, and reading the effect out loud. It will remain active until the start of the next game round. The Winds of War help steer the game in the early, mid and late stages. The Player turn involves capturing, giving orders, and resolving battle. First the player sees if they can capture any locations. If, on any particular location, they have at least 2 more army cards than any other player, they take that location card and add it to their discard pile. When giving orders, the player discards cards for resource points used to deploy, purchase or rush their cards. Deploying involves moving a card from the player’s hand to a location. Purchasing a card moves it from the player’s reserves to his discard pile. Rushing a card moves it from the player’s reserves to a location directly. Battle consists of attacking each location where a player has cards present that also contains other players’ cards. Players add up the total power of their cards at the location and declare which enemy cards they can destroy. Then all players simultaneously place their destroyed cards in their discard piles. Once this step is completed play continues to the next player. If the last player has had their turn, the game continues with a new Winds of War step. There are two ways the game can end. 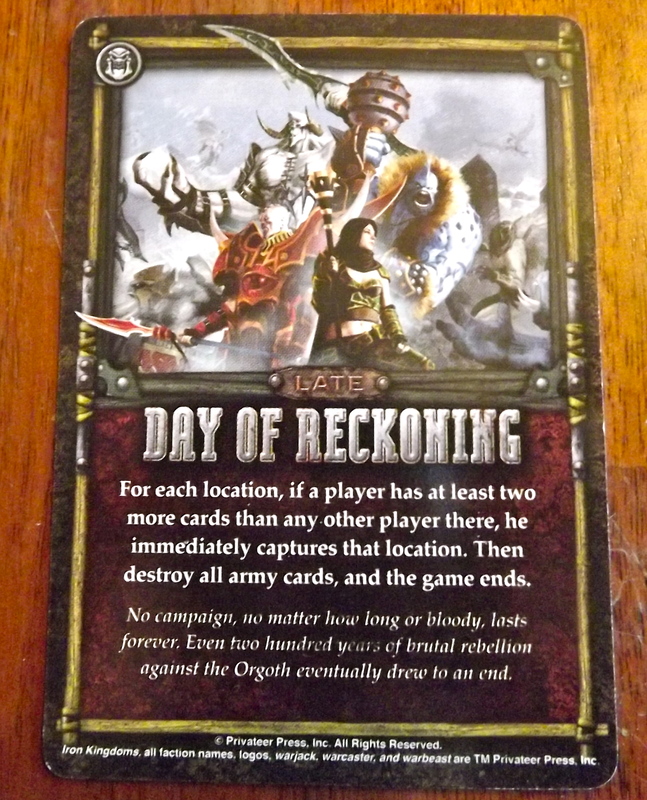 The first is revealing the “Day of Reckoning” card during the Winds of War step, and the second is if there are no remaining location cards. Once the game ends, the player with the most victory points wins! With two factions vying for dominance of the battlefield, Hordes: High Command captures all the elements that I have come to enjoy and love from the minis game. Game play is straight forward with very few grey areas. Turns progress smoothly giving experienced players a fast-paced level of play. Inexperienced ones will have no problem picking it up, and by the second or third game enjoy the same pacing that really makes this game shine. It is very well designed and you can tell that the designers put a lot of thought into what makes it what it is; they didn’t just fit a Warmachine/Hordes label on something that wouldn’t have conveyed the theme and feel of the miniature game properly, they designed the game around that feeling. The Circle takes the Bloodsmeath Marsh for 4 VP! Unlike the straight combat of the minis game, this one is more about resource management. Every turn and step feels important and that those choices you make will have something to do with the ultimate outcome of the game. It never felt as though I was just going through the motions, or wasting any of my turns with sub par decisions. I always wanted to do too much during my turns, and with the resource constraints of my army, there was always be something that I couldn’t do! Choices have to be made between buying a card for its value to your team and combat skills, or for its resources to purchase higher value cards. Concessions are constantly being made, and strategies are kept fluid due to your opponent forcing your hand. Not only do you lack resources, and already have to make tough choices, but your opponents’ decisions will also force you to make some hard calls. Do you go to a particular location for its point value, or just to block your rival from getting it? It is a struggle to maintain a strategy, and feels more like a skirmish than a long term advance. The combat itself is very easy and intuitive. It comes down to basically having more combat points at the location you are trying to capture than your opponent. Something that I have come to expect from Privateer Press. Using the skills and battle prowess of your mighty Warlock battle commander you use the resources at your disposal to bolster your ranks. Command and War points are sacrificed to bring forth mighty soldiers and epic warbeasts to pummel your foe into submission. These come in both the attack and support variety so getting to know your army; specifically your heavy hitters; is a must. Will you tear the face off the opposing side using an massive acid spitting Ravagore, or send in a legion of Durids of Oroboros to set up the perfect synergy for the next turn? 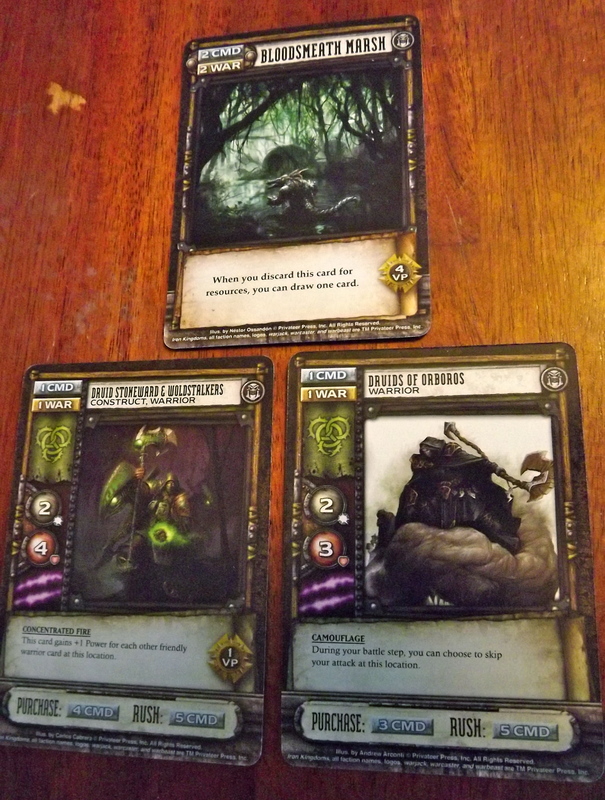 Hordes base game plays up to four players, and it can be intermingled with the Warmachine version as they are identical except for the factions. I do believe that the game plays best with just two. With three or four players there can be a lot of downtime between turns. The leader is obvious which can lead to ganging up on him/her. That can draw the game out over a longer period of time. However, the beauty is its fast pace, and three or four players may sacrifice that element. You select one of fire Warlocks to command your forces, each has their own strengths and weaknesses and abilities that change the way you play the game. The forces you can deploy are colour coded, as are the Warlocks themselves, meaning some Warlocks can only take some of the available cards. This helps to emulate the battle style of each ‘Lock and keep the game in balance. Tyrant Xerxis of the Scorn is a blunt instrument used for smashing his way through enemy lines, he would do poorly in a support role, so most of the cards he can bring a long for the ride are quick support warriors or big tough beasts, where as Kaya the Wildborne of the Circle of Oroboros is all about the cunning long game, she carries with her a good mix of hard hitting infantry and… if you like wolves… she’s your lady. This variance within the factions allows for a good amount of replayability. Chances are if you enjoy the them of one of the factions, they have a Warcaster that’s right for you. Careful of the Warlocks of the Circle and Trollbloods! That being said the game didn’t convey to me the grand scale of being at the head of an army of monsters and miscreants. It is technically sound and the theme does come through, I just didn’t feel as though I was thoroughly engaged in the world. I had fun playing it and enjoyed it as a deck builder, but I just wish there could have been more to draw me in. The world of the Iron Kingdoms is one I cherish, but I just didn’t get the immersion I was looking for. Don’t get me wrong. It is still thematic, but I was looking for more – like the feeling I get from playing with the miniatures. Fans of Warmachine and Hordes (Warmahordes for short) will probably get the most enjoyment out of this title, but those who aren’t may find the thematic depth lacking. Don’t expect High Command to be a gateway to the minis game. You won’t play this one and then feel like you need to buy the models and start on that slippery slope. 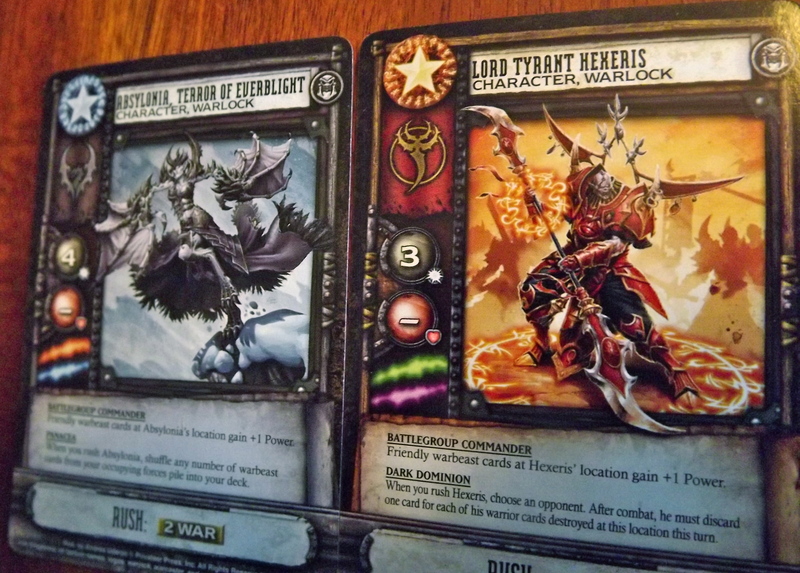 Legion and Skorne are forces to be reckoned with! Components are comprised of just cards and they are of high quality. They shuffle well, and don’t have a lot of glare, which makes them easy to look at under lights. Layout leaves a lot to be desired. They are graced with gorgeous artwork, but it is too small. With the graphic design as it is, they could have given the artwork a lot more room, and have the cards stand out more. For a game that relies on the text of the cards to let you know what you can and cannot do, they made it extremely tiny. It is very hard to read and since you are constantly looking at the text, this leads to problems. People with poorer eyesight will have a very hard time with this. A lot of the card is blank space. Again, they could have utilized that by making the artwork and text larger, without having to sacrifice anything other than wasted space. The box is great. It has lots of dividers for the various cards and is made of sturdy materials, so you know it will handle a lot of wear and tear. 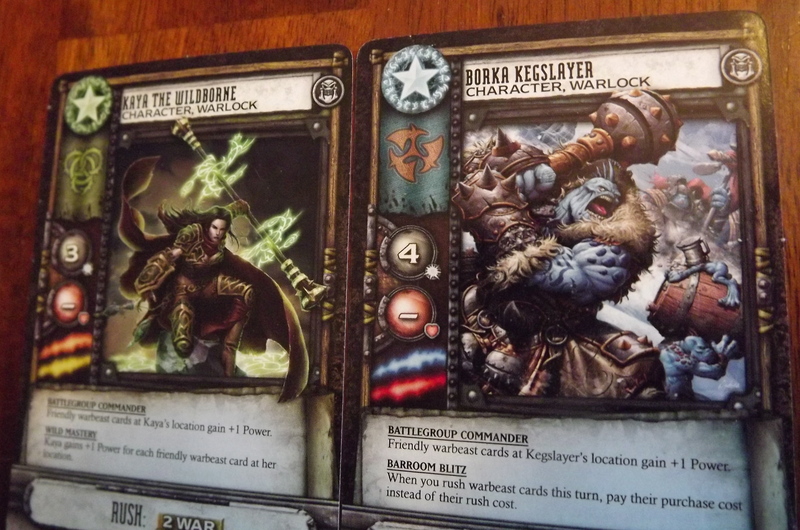 I’m a huge fan of Hordes and Privateer Press, so when I saw the deck builder there was no doubt in my mind that I had to have it. The game is well designed and flows smoothly and intuitively. Everything I could ever want. I just wish it was more immersive than it is. Iron Kingdoms is such a wonderful world, and I had hoped to have more of an interactive experience like the mini game gives me, but in a deck builder. Still, I really relished what I have gotten out of this game! Smooth and intuitive game play. Text is difficult to read.